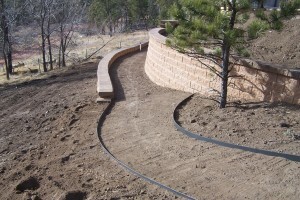 Landscape edging is a great way to accent your landscaping and most of it is easy to install. 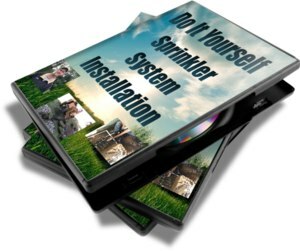 With my experience I would like to provide you with helpful tips, preparation, what not to do and what equipment to use. Before you start, call for locations so that you will know where your telephone, gas, water and cable tv are located. Never assume that they are buried deeper than you are digging. Decide where you would like the edging to be, get a can of marking paint or a string and lay out where the edging will go. Make your own shape and design, remember to have a flowing line with even measurements in the straight areas. Hint: If you are placing edging around the foundation of a house or building, remember to have the dirt slope away from the foundation for drainage. When I dig edging in by hand, I like to use a 6” to 8” straight spade. This helps me cut into the sod and soil with a straight cut, and also gives me a straight edge to install the edging. I dig into the ground 4” to 6” deep depending on what type of edging I’m using. On the inside of the edging (this where the mulch and planting areas are) dig this area out at a 45 degree angle 4” to 6” back from the edging. Place your edging in the trench, connect your pieces, anchor into place then backfill. When back filling, Ieave 2” to 3” below ground level on the back side of the edging (this is where the mulch and planting areas are) below the top of the edging. This will provide space for your mulch. When this isn’t done the mulch will spill over the edging onto the lawn area. 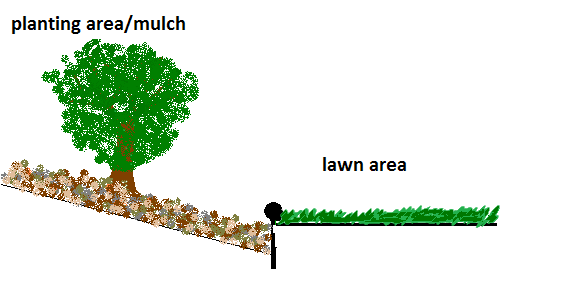 I like to have the top of the edging on the lawn side 1” to 1 ½” above the soil line, not above the grass. In my opinion this make for a cleaner look. I don’t want to see too much of the edging. Remember not to have the edging sticking out of the ground too much so that with the seasons it will not heave out of the ground. 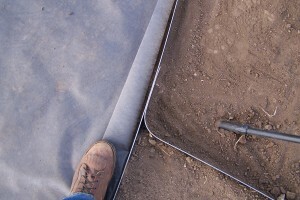 This process of digging in edging is the same for PVC, steel, or aluminum edging. If I have a lot of edging to dig in, I use my bed edger. This piece of equipment is fast, efficient, and available to rent at most equipment rental stores. If you use a bed edger there should be no problem installing 300’ or more of edging in one day. Below is a picture of mine with two different types of cutting blades. 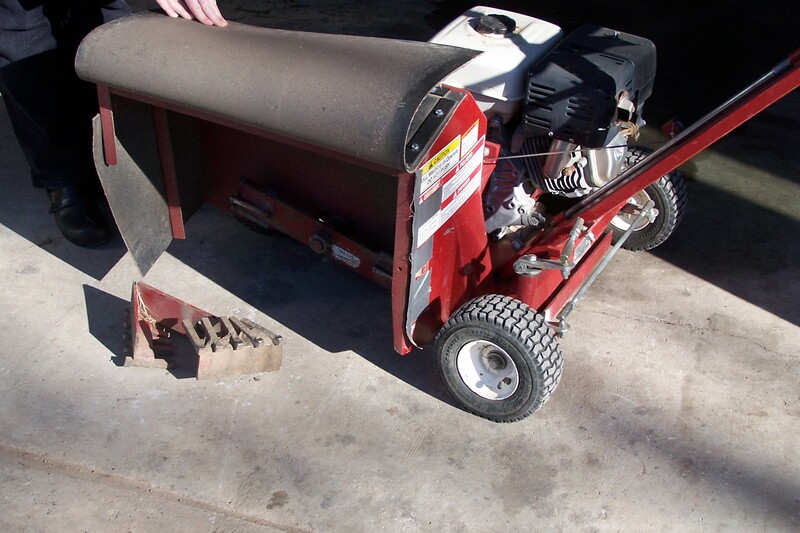 If you rent a bed edger let the rental store know what it will be used for and have them go over the controls. Remember to wear safety glasses, these things will kick up some rocks. For PVC or plastic edging I always use Black Knight or Black Jack name brands. This edging is thicker and tougher than most brands, cost around $1.10 per foot. A good place to purchase these products is at your local nursery or on line. 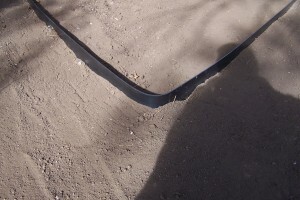 Black Jack and Black Knight edging comes in 20’ lengths runs 4” to 5” deep. 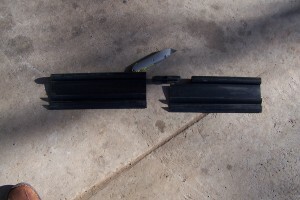 There are PVC connectors and stakes that come with each piece of edging. Never use that PVC edging in rolls that you buy at hardware stores, it’s terrible to work with and does not last. 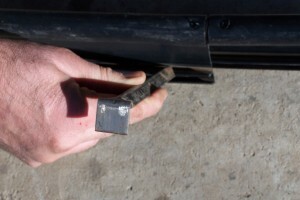 To connect two pieces of Black Jack Edging together, cut one piece to receive the other as shown. Place the PVC coupler into one side and adjoin both pieces. I always get two 1½” deck screws and screw through the edging and coupler in two places; this helps prevent the joint from pulling apart with temperature changes. Plastic contracts and expands a lot. Grab your metal stakes and drive them through the edging into the ground at a 45 degree angle (Place your stakes two in the middle and one in each end), then bury your edging making sure it follows your desired shape. This type of edging gives you a very clean and defined look but it is typically the most expensive to install but you can save money by making your own. See next paragraph. There are several brands of steel or aluminum edging out there, Three that come to mind are Permaloc, Curv-Rite and Col-Met. It can come in different lengths and colors green, brown or black. These install pretty much the same way as PVC edging does. The best thing to do is to follow the instructions provided. The type of steel edging that I typically use Is 1/8”Thick x 5” Wide x 20’ L mild steel gray/black in color . You can purchase this at most steel distributors for approximately $2 -$2.50/ft. This edging will rust over time and give the top edge a rusty color but it will take at least 40 years or longer to rust through. This is not noticeable because most of the edging is buried and still gives the same clean edging look that other colored steel edging gives. When I’m placing this edging in the ground I don’t use stakes or anchors. It’s wide and heavy enough to stay put. It takes two guys to install, they’re heavy and awkward to handle. Take note of the pictures below. I just overlap the ends by 5”, clamp them to gather, drill a pilot hole, install two screw for every joint or change of direction, and cut the end to fit. Then bury the edging the same as the PVC edging. This type of edging has come a long way. It looks great, comes in various colors, durable, different shapes and has its own look. In most cases this will need to be installed by a contractor with the equipment. Concrete edging can and does get installed the wrong way and will crack (More than normal), move and can look terrible. Make sure you hire a good contractor, ask to see some of their work and how long have they been in business. Sometimes concrete edging that has been colored will fade over time if not taken care of, you need to ask the contractor what to apply to the edging to preserve its color. We landscaped a yard 9 years ago and the homeowner went with a contractor that installed concrete edging which was red in color. They didn’t take care of it to preserve the color and now it looks pink. In your experience, what is best to use. I was thinking aluminum. We used PVC before and it popped up over time and was a lot of maintenance. I am concerned any of them will pop up over time. If the edging is installed correctly, most of the time the edging will not move whether it is steel aluminum or pvc. I will say steel and aluminum edging is better than pvc, it is stronger, resists movement and pins down better. 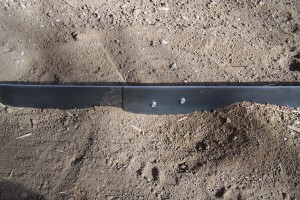 If you use steel or aluminum edging be prepared to spend 2 to 3 dollars per foot. I also try to make sure the edging is at least 4″ to 6″ wide so there is more material to bury.